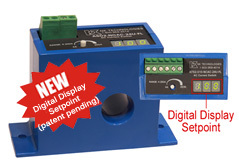 The new ATS Series available at CDI combines two sensors into one package. The factory set analog output calibration produces an accurate and stable signal by eliminating field zero and span adjustments. The trip point is adjustable from 2% to 100% of the analog range, and can be verified at any time by viewing the LCD display on the sensor. Any adjustments made by unauthorized personnel will be displayed, further improving overall system reliability. LED Display provides quick visual indication of where the contact changes for easy, accurate setpoint adjustment. Choice of 4-20mA, 0-5VDC or 0-10VDC output; each output offers a range that is proportional to either 0-50 A or 0-200 A.
Built-in Mounting Feet for simple, two-screw panel mount or attach with optional DIN rail brackets. Use the alarm contact to turn on a revolving beacon light when a jam occurs, while the analog signal reports usage to a data acquisition system. The analog signal is fed to a local panel meter to display current use, and the contact closes to alarm on low current caused by loss of head pressure. The analog signal is sent to a PLC to record time of use and estimate power consumption while the contact controls the starter coil, shutting the machine down if an overload occurs.